The Harlem Globetrotters are always ready to teach some basketball tricks to appreciative audience. There’s high school basketball, college basketball, professional basketball, and then there’s the Harlem Globetrotters. The world famous Harlem Globetrotters are bringing a slice of home to U.S. troops based overseas with an extended holiday tour of global U.S. military bases, and the ball bounces here –at the Camp Foster Field House and Risner Fitness Center on Kadena Air Base—on December 9th and 10th respectively. This free performance begins at 6 p.m. at the Fieldhouse on Tuesday and 5:30 p.m. at Risner, sponsored by Navy Entertainment, MCCS & Armed Forces Entertainment. Entry to both shows is on a first-come basis until the venue is full. Sometimes even Globetrotters need a helping hand. This is the 13th time in the past 11 years that the “Ambassadors of Goodwill”™ have entertained U.S. troops overseas. The 11-game tour, which began only days ago, will feature shows on U.S. military bases in Japan and Guam. Globetrotters military tours have visited over 40 U.S. military bases in Afghanistan, Bahrain, Belgium, Cuba, Djibouti, Germany, Greece, Guam, Italy, Iraq, Japan, Kuwait, the Netherlands, Portugal, Qatar, South Korea, Spain, Turkey, the United Arab Emirates and the United Kingdom. For the sixth straight year, the tour will feature a specially-created camouflage basketball, in addition to the Globetrotters’ iconic red, white and blue basketball, the Globetrotters will also be playing with a camouflage basketball during a portion of each game in North America on their upcoming 2015 “Washington Generals’ Revenge” World Tour as part of their Harlem Globetrotters Hometown Heroes initiative. The Harlem Globetrotters Hometown Heroes program is designed to pay tribute to active, retired or wounded members of the military. The initiative was launched during a special exhibition game on Oct. 6, played on the flight deck of the famous Intrepid aircraft carrier in New York City. 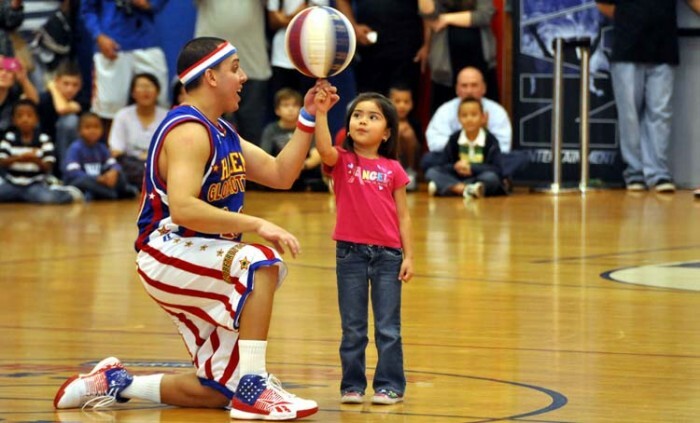 Harlem Globetrotters Hometown Heroes will be honored during each of the 310-plus games on the team’s 2015 North American Tour, which runs from Dec. 26, 2014, through May 2015. Sponsored by World Vision, Greyhound Lines and Baden Sports, The Harlem Globetrotters® are celebrating their 89th consecutive year, continuing a world famous tradition of ball handling wizardry, basketball artistry, and one-of-a-kind family entertainment that continues to thrill fans of all ages. 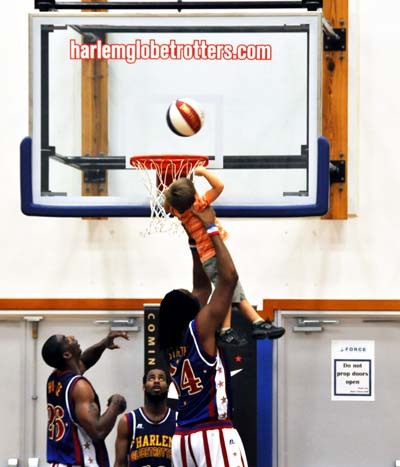 Harlem Globetrotters International, Inc. is a wholly-owned subsidiary of Herschend Family Entertainment Corporation, the largest family-owned themed entertainment company in the U.S. Throughout their history, the Original Harlem Globetrotters have showcased their iconic talents in 122 countries and territories on six continents, often breaking down cultural and societal barriers while providing fans with their first-ever basketball experience. Proud inductees of the Naismith Memorial Basketball Hall of Fame, the Globetrotters have entertained hundreds of millions of fans-among them popes, kings, queens, and presidents-over more than eight thrilling decades.